They're freaking me out. If you don't like what alcohol tastes like you can 1) learn to like it, 2) not drink, or 3) become a master of the fresh fruit juice and cordial cocktail that packs a punch without tasting like alcohol. But root-beer flavored booze? Christ. What's next - bubblegum? Mother's milk with a kick? And it's getting this huge advertising campaign, too, as if this were a socially acceptable drink, and not something shameful, like pouring vodka into a Big Gulp of grape soda. 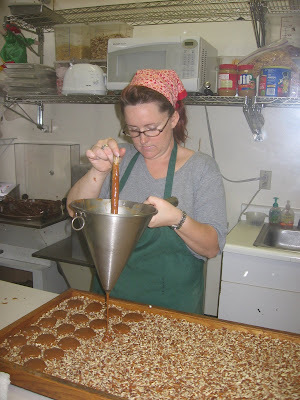 Making pralines at Southern Candymaker. (The rum ones are the best). 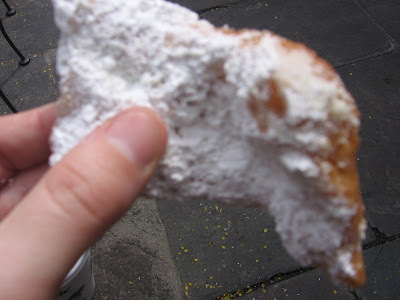 A rather blurry image of a beignet - it was the best I could do. Frankly, my mind wasn't on photography. Did I mention that they come hot? My Jambalaya Supreme at Coops. 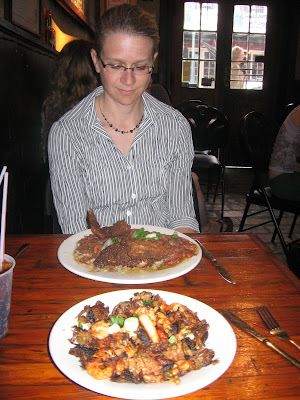 I forget what Tami had, but she's looking rather bemused at my need to photograph lunch, isn't she? At the farmer's market. 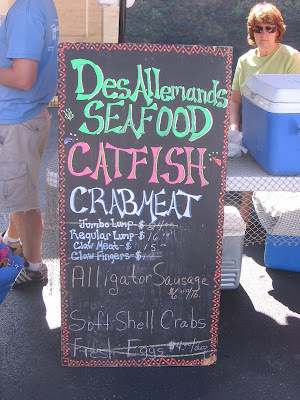 It is almost physically painful to go to a place where you can buy alligator sausage, 57 varieties of tomato, and crawfish, and all sorts of vegetables - but be without a kitchen. I sulked and bought jam. Eating in New Orleans. Okay, that was about a month ago. I still need to upload the pictures. But everything they say about food in New Orleans is true: the po' boys, the beignets, the jambalaya, it's all fantastic. My favorite dish (besides the powdered-sugar-covered Cafe Du Monde beignets I ate every chance I could get) was the oyster-artichoke soup at Mandina's. My. God. Strangely, I didn't really love the raw oysters I had in New Orleans. They were good, mind you, and quite large, but they didn't have the level of brininess New England oysters have, and I missed that zing. But the creamy oyster artichoke soup was another story entirely. I would never have though of that combination, and now I dream about it. Dieting. Yes, heaven help me, I've been dieting. Well, kind of. More a question of tracking calories to figure out just exactly why I've become big as a house of late. I've been using Daily Plate, which has a very basic calorie-counting program that I find both useful and terribly frustrating. I'm sure it's easy to use if you generally buy food from restaurant chains, but if you cook, it's not simple. I don't use recipes most of the time, so I have to enter my approximations for the amount of tortellini, chicken sausage, red pepper, olive olive, parsley, tomato, and cheese that went into dinner, then figure out how many serving I got out of it. (Two, for dinner, and one more lunch so far). This is irritating. However, I've already learned a few things. For one thing, I overestimate the calories in meat, and underestimate the calories in baked goods like muffins. Score one for Atkins. I'm also better off having scrambled eggs and toast for breakfast than a whole wheat bagel with light cream cheese. Neither sounds like a bad option, but eggs and toast are lower in calories and keep me feeling full longer. So, that's a small change that makes sense. Attending the big pig roast. My friends have a pig roast every year or so, and once again, I'm blown away by how much better pork is if you cook the whole damned thing at once. Something about all that melting fat saturating even the leanest cuts, I suspect. But damn is it good. I made the famous Chowhound Elvis Cake (banana cake, chocolate chips, peanut butter frosting). It rose wonderfully high and was quite moist, but almost too light for my tastes, with a crumb like a box cake. But I loved the peanut butter frosting, and the marzipan Elvis pig I made for the top went over well with the crowd. (And it shows just how far I've gotten away from blogging that I didn't take a picture. Someone did - maybe I can hunt it down). That's all the food news, I think. In other news, I'm getting married September 20. Very exciting. Just to keep the announcement food-related, I'll tell you we're having barbecue from Blue Ribbon, a great local place, plus watermelon and lemonade and all that good stuff. Instead of cake (which I don't really love), we're going to have a pie buffet. The wedding will be on the beach, so it should be very casual and fun and lovely. And that's all the news that's fit to post. A new Gallup poll finds a solid majority of Americans (62%) support "strict laws regarding the treatment of farm animals." 29% support strongly. That's actually pretty good, and the difference across political parties is not as great as one might expect - Independents and Democrats are the same (66% and 67%), while Republicans are lower, but not by a lot (53%). On other animals rights issues, the party split is much larger. A good sign for ethical farmers; the public is fairly supportive. Of course, if I were designing the poll, I would want to look at a few additional factors. There are probably some small-government types who object not to the goal, but to the method (strict laws), so it would be nice to get a general support measure - say, for a voluntary system of credentialing humane treatment, and how likely they would be to buy products with such a credential. Also, how much more would they be willing to pay. I would want to know how many people currently take animal treatment into consideration when purchasing food (watch that number drop to the single digits), and also what they think the term "free-range" means. Ah, to have a polling budget at my disposal!